Germany means high technology, engineering and machines, climate change and renewable energy, science and research, quality and precision … But will these traits ensure a successful future for German business, or do actually hinder the ability to change? Whilst German industry is packed full of industrial giants – BASF to Bayer, BMW to Bosch – Germany is now also becoming a nation of entrepreneurs, harnessing the academic excellence and commercial infrastructures to create a new generation of business. Germany has been so successful in industrial engineering and production, that is has perversely been quite difficult to look beyond product and process for new types of innovation. The academic discipline and rigorous application of proven methodologies has even stifled the freethinking (more imaginative, more intuitive, more irreverent thinking) that is so common to many of the world’s innovation hotspots. Having lived and studied in southern Germany (I studied high temperature superconductivity physics at the Albert Ludwig Universitat in Freiburg im Breisgau), I became acutely aware of this “engineer” mindset. Whilst I hate stereotypes, there is something in the German psyche, that seeks logic and precision, detail and structure. Having spent the last 30 years working across the world with many different companies, including German brands (including Allianz, Bosch, Henkel, Lufthansa, T-Mobile and Volkswagen), I notice a difference to other countries in both West and East. Most business people seek academic doctorates for example, and continuous professional development is rare. Most German businesses are family owned, with strong influence from owners and also from unions. Most businesses are incredibly product-centric, with a services and service culture slow to take hold. Of course German businesses have been incredibly successful – they have been the engine of European growth for the last 50 years. But their innovation has largely been incremental – making existing business, products and processes, better. Prof Khairy Tourk, of the Stuart School of Business in Chicago, says that Germany’s strong position in fields such as automotive engineering, chemicals and factory machines has given the country a “resilience” in the face of economic adversity that made it stand out compared with other countries such as the USA and United Kingdom. “Germany has performed brilliantly when it comes to adding new ideas to products and processes in the kinds of sectors in which it has traditionally excelled,” says Marco Annuziata, GE’s chief economist. “If you look at a BMW car you will find it packed full of the kind of incremental innovation that the Germans are good at and which gives the country a reasonable amount of self-confidence for the future” adds Tourk. Therefore this is certainly not a criticism. But it does provoke a question, about how this approach to innovation will be sufficient in a world of more dramatic changes. Like any successful business, it is hard to let go of the model that made you successful, and tempting to keep squeezing more out of what has worked before. However the success models of the past are unlikely to create future success. What’s the challenge for German innovation? Do German businesses have the imagination to adapt to a changing world? Where factories are displaced by 3D printers, where robots and AI can replicate the know-how of a highly skilled worker, and where emerging markets can replicate the quality of production at much lower costs … can German leaders develop new ideas, alternative strategies and business models, innovative products and services, to compete in this new world? The answer has to be yes … And the more enlightened German business leaders are waking up to the new challenges, and to the new challengers. In fact, walk around the streets of Berlin, for example, and you will see a start-up culture every bit as vibrant as Silicon Valley, Stockholm or Shanghai. The youth culture, the irreverence and collaboration, of “hippy” Berlin is actually driving a new mindset in business. Gone are the suits who only see process diagrams and quality assurance, in come the punks (ok, millennials, hipsters, creatives) who have passion and vision to disrupt the status quo. Large organisations are desperate to innovate differently too. Daimler set up a completely separate team to drive its Car2Go project, whilst Bosch is collaborating with Nvidia, the brains behind most autonomous cars. Whilst some business leaders struggle to grasp the new world, others are embracing it rapidly. Design thinking, for example has become one of the most sought-after business disciplines, because its more intuitive approach is so needed. Similarly Business Model Innovation, has given the technocrats a new context for their structural thinking. How to develop more innovative leaders? “Gamechangers & Business Modeling” is an executive program that I have developed in partnership with GERBUS Academy in Hamburg. It is based on my recent bestselling book Gamechangers which is available in German, but goes much further in focusing on the practical issues and opportunities for small to large (and particularly mid-size) businesses in Germany right now. It provides an accelerated learning platform for business leaders to explore, practice and apply these new approaches. Over 4 days (2 x 2 days of fast, intensive, inspiring learning), we bring together both the inspirational ideas and practical techniques to apply to your own business, and to drive innovation and growth in this new world. Specifically for business leaders, the executive program sets the new strategic context for businesses, learning from today’s fastest-growing, most-innovative businesses. We explore “game changing” strategies for challenging existing markets and mindsets, and how to make the right choices in fast and uncertain times. Each participant develops a new “strategy roadmap” for their business that is driven by the best new opportunities for you to innovate and grow. We combine this with design thinking to embrace new customer insight, to innovate new business model, built around new customer propositions. We then bring together the new toolkit of lean and agile disciplines to drive implementation, and sustain growth. Most significantly, we explore the changing role of leaders – how you need to be the leader of change, but may also need to change yourself, to be effective. 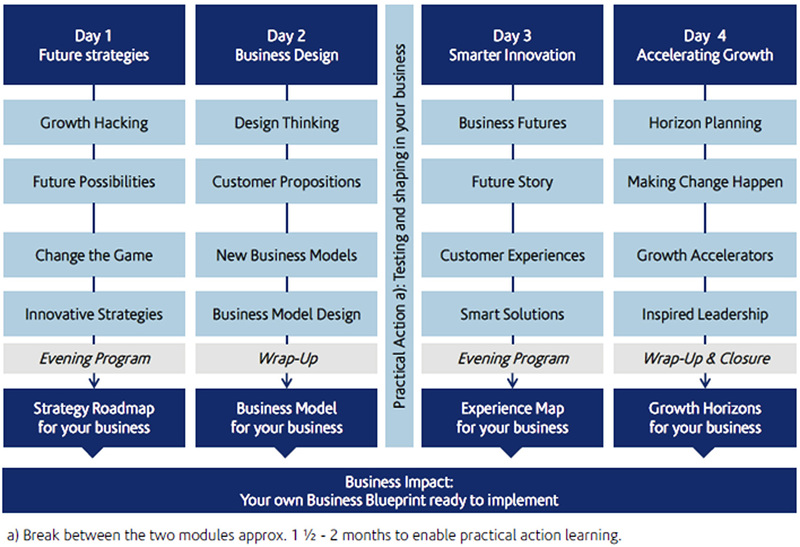 The outcome is a “business blueprint” ready for you to implement. You can find more information regarding the program, including dates for the upcoming program, on the GERBUS Academy website or click here. Hoping to see you there!